Geez… it’s hard to believe, but another Minnesota summer is almost history. The long hot summer days are slowly coming to an end and before you know it your warm-weather outings will soon just be memories. For many people, it marks the things like vacations ending, children going back to school, and the arrival of the Minnesota State Fair. It’s also summer’s last big holiday – the Labor Day weekend… and thousands of Minnesotans will be hitting the lakes and rivers with family and friends to wrap up the summer! However, because crowds are expected, please remember to boat safe, boat smart and boat sober during the holiday weekend. The Minnesota Department of Natural Resources offers some great advice. Boat safe and sober this Labor Day weekend! To help insure a safe outing, these are a few tips which every boater should know. • Wear a life jacket. According to the latest data available from the United States Coast Guard (2012 Life Jacket Wear Rate Observational Study) there were 533 drowning deaths in 2011. Unfortunately, 415 of those individuals were NOT wearing a life jacket. In other words, approximately 84 percent of those deaths might have been prevented if life jackets were in use. • Know the water and environment you will be boating on. Check the weather and water conditions and know where hazards like sandbars or stump beds may be located. Every year, 13 million boaters face shifting shoals, changing channels, moving buoys, and newly discovered hazards. These changes happen daily, and it’s your responsibility to be aware of them. • Keep a good lookout while underway. 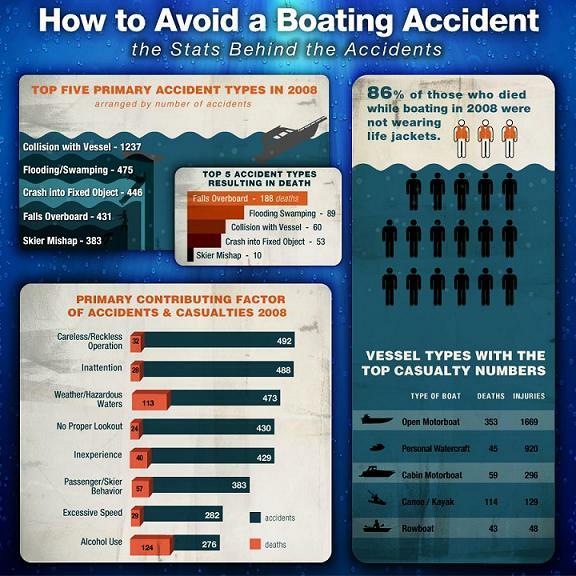 According to United States Coast Guard statistics, operator inattention and improper lookout continue to be among the top five leading factors in most boating accidents. • Shut your engines off when people are in the water near your boat. • Check the weather forecast before getting underway. • Keep a balanced load and trim boat. • Don’t overload your boat. • Don’t ride on the gunwale, bow, seat backs or any place that is not designated for sitting. • Finally, don’t drink and boat. Alcohol use continues to be the single leading factor contributing to boating accidents. Don’t become a statistic. Also, please be aware of the signs, buoys, sirens, fencing and flashing lights you may see around. These are all intended to notify you of areas where water may rise swiftly, no trespassing or no diving is allowed or footing is unstable. So, if you’re one the folks that are going to be out to take full advantage of the extended Labor Day weekend, remember to boat safely! And please, please for the billionth time, pay attention, slow down, and wear a life jacket to avoid any problems!!! The last thing you need on Labor Day is a boating accident to ruin a great holiday weekend. And for heavens sake… don’t forget to file a float plan! Anchor Marine wishes everyone a fun and safe 2013 Labor Day!!! As Labor Day approaches it marks the end of summer. All around the country people will be celebrating on the water. As many people are heading out on the water, keep in mind proper boating safety, compared to other summer months, September has the highest percentage of boating fatalities at 13% due to Labor Day. With that, check out ways to avoid a boating accident for a Safe Labor Day Celebration. I hope as a boater this safety information will be helpful. Spread the word!